As science becomes more data driven and computational, there is an increased demand for datasets and tools that are easy to share, use, extend, and customize. Frequently, interdisciplinary and/or international teams of researchers, practitioners, and educators must synergistically combine methods and techniques from different disciplines of science to answer key research questions. This talk will argue for a free and open data-code infrastructure for science of (team) science research. Exemplarily, it will introduce the Scholarly Database (SDB) (http://sdb.cns.iu.edu) and the Science of Science (Sci2) Tool (http://sci2.cns.iu.edu) that are actively used in science of science studies in academia, industry, and government. SDB provides free access to 25 million paper, patent, and grant records that can be cross-searched and downloaded as data dump in common table and network formats. 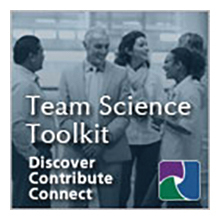 The Sci2 Tool reads 15 different data formats; has more than 160 data analysis, modeling, and visualization algorithms and tools; and can be easily customized and extended. Both empower users to use, improve, or repurpose large and diverse datasets and code, easing the design and replication of scientific studies.